The PT2SCAN scanners are dual technology Scanners, RFID UHF and Barcode Scanning suitable for commercial and industrial use. Three models are available RFID UHF only, RFID UHF with 1D Laser and RFID UHF with 2D Imager. They are compact and lightweight, ergonomically designed for easy and immediate use, without the need of special settings and calibrations. With the software provided they can be configurable and customizable. They features a single push button, 4 led, one buzzer and one vibrating motor for its control and use. Simplicity is the fundamental characteristic, of the PT2SCAN, which makes it ideal even for the most mundane tasks. Features a backup and tamperproof Real Time Clock, which if required, can time stamp each transaction. The scanners can operate in two modes. 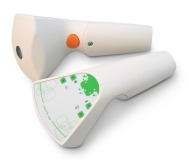 In STAND ALONE mode the scanner is fully independent and can store transactions in its internal memory which can then be downloaded once connected. In ON-LINE mode the scanner is controlled by a remote device through the USB or BLUETOOTH ports. It is possible to reprogram the STAND ALONE functionally using the utility software.